The following historical booklet of the Palestinian prisoners’ movement was originally released in 1984 in English and Arabic by the Palestinian Prisoners’ Committee, based in Damascus, Syria, and is now being made available online for download and distribution by Samidoun Palestinian Prisoner Solidarity Network. While focusing on depictions of Palestinian art created inside Israeli prisons – often on pillowcases, with smuggled and secreted materials, and removed covertly from the prison walls – the booklet also contains facts and descriptions about the situation faced by Palestinian prisoners in 1984. Some of the art in this book was also featured in the Made In Palestine exhibition, which debuted in 2003 at the Station Museum in Houston, Texas. Its curator, James Harithas, was introduced to the broad spectrum of Palestinian art by featured artist Samia Halaby, whose new book of artwork commemorating the massacre of Kufr Qassem is soon to be released. (Some of the artists featured here are also included in Halaby’s work, Liberation Art of Palestine, which traces prisoners’ art as part of the overarching stream of liberation art produced by Palestinian artists in the movement.) Zuhdi al-Adawi, one of the artists featured in the booklet, traveled to New York City in 2006 for the opening of the exhibition. The film, Crayons of Askalan, also features some of these works and the story of Palestinian prisoner artists. The booklet contains excerpts from the London Sunday Times’ 1977 investigation into torture in Israeli prisons, the same investigation that helped to bring the torture of Rasmea Odeh and Palestinian women prisoners to a Western audience. It includes an overview of the various prisons were Palestinian political prisoners were held at the time of publication in 1984, the forms of torture used under interrogation, living conditions in prisons, medical mistreatment and prisoners’ resistance. 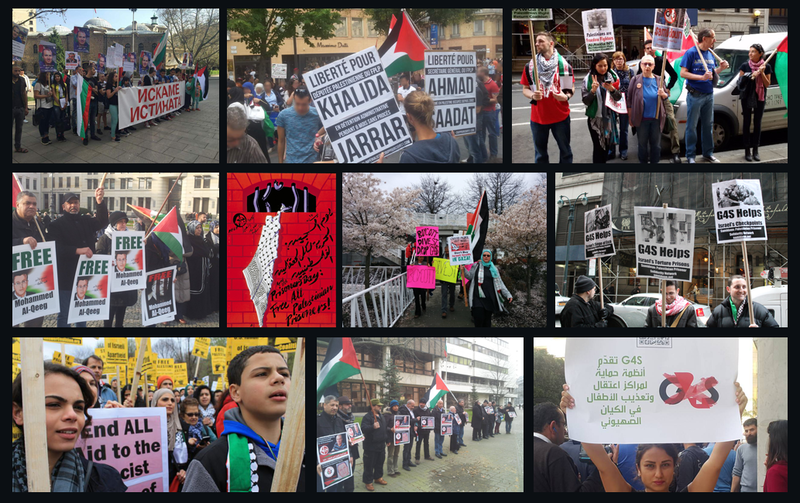 It ends with a call to people around the world to take action to support Palestinian prisoners, “form support committees everywhere,” and “unite all efforts to help secure the just demands of these prisoners and condemn the inhumane Zionist practices,” a call to action that remains just as critical today as it was 32 years ago. The book is available for view and download below in PDF.